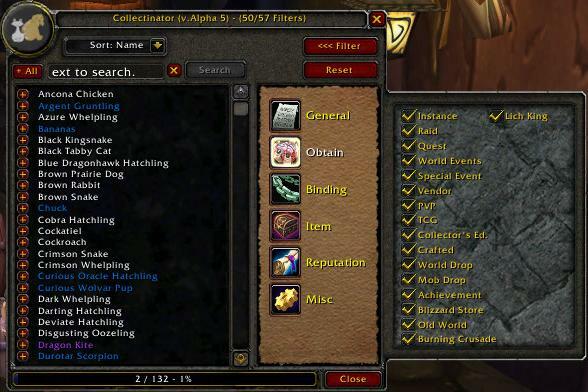 Collectinator provides an interface for scanning companions and moutns to find what is missing. Companion database which we are parsing. Companion DB is updated by reference. Adds a companion into the database. The database (array) which you wish to add data too. Type of entry added to the database. The [http://www.wowwiki.com/SpellLink Spell ID] of the item being entered to the database. Game version item was found in, for example, Original, BC, or Wrath. None, array is passed as a reference. Adds acquire methods to a specific companion. The database (array) which you wish to add acquire methods too. The [http://www.wowpedia.org/SpellLink Spell ID] of the item being entered to the database. A listing of acquire methods. See database-documentation for a listing of acquire methods and how they behave. Adds filtering flags to a specific entry. The database (array) which you wish to add flags too. A listing of filtering flags. See database-documentation for a listing of filtering flags. Clears the exclusion list of all entries. The exclusion list is cleared. Reference to the entire database. All entries which are to be excluded in the database have their display flag marked to false. Causes a scan of the companions to be conducted. Boolean indicating if we want the output to be a text dump, or if we want to use the GUI. Boolean, true if we're triggering this from an event (aka we learned a new pet), false otherwise. A frame with either the text dump, or the GUI frame. Removes or adds a item to the exclusion list. The specified [http://www.wowwiki.com/SpellLink Spell ID] is excluded from the database. Prints all the ID's in the exclusion list out into chat. All the entries in the exclusion list are printed out into chat. Gets a spell ID from a spell link. Total number of items in the scan. Total number of items known in the scan. Total number of items filtered during the scan. Total number of items known filtered during the scan. Total number of items unknown excluded during the scan. Total number of items known excluded during the scan.